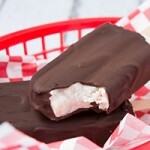 Chocolate-covered dairy-free ice cream on a stick. Made with just 7 healthy ingredients. When you eat healthy, you feel better. It’s science. The cool part? Healthy can be popsicles. Healthy can be ice cream. It’s all in the ingredients. 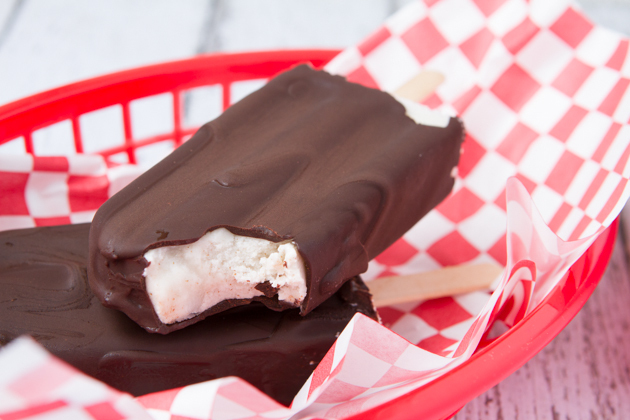 You could buy a “low calorie” ice cream bar made with: milk, cream, sugar, corn syrup, skim milk, whey, buttermilk, mono & diglycerides, carob bean gum, cellulose gum, carrageenan, vanilla extract, vitamin a palmitate, sugar, palm oil, whole milk powder, unsweetened chocolate, cocoa butter, whey powder, nonfat dry milk, soy lecithin, pgpr and artificial flavor. Or, you could make a dairy-free ice cream bar with: cashews, coconut nectar, coca powder, vanilla extract, chia seeds and coconut oil. 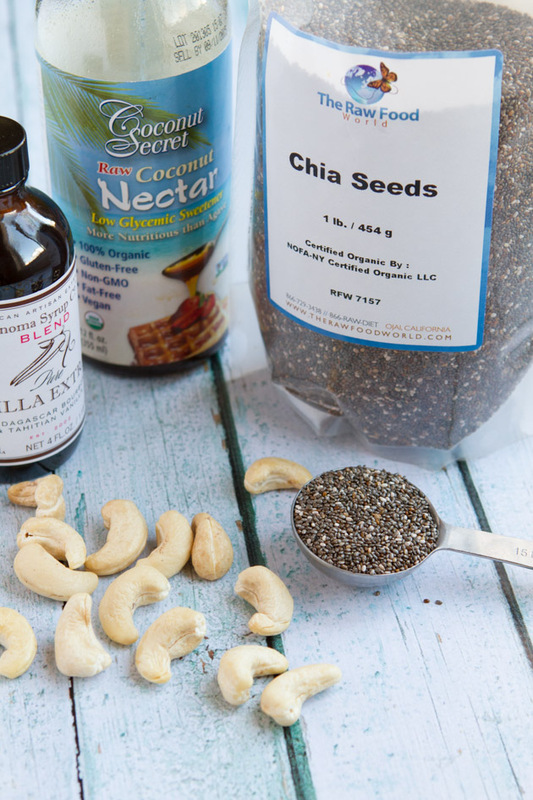 REAL ingredients that our bodies can actually USE. 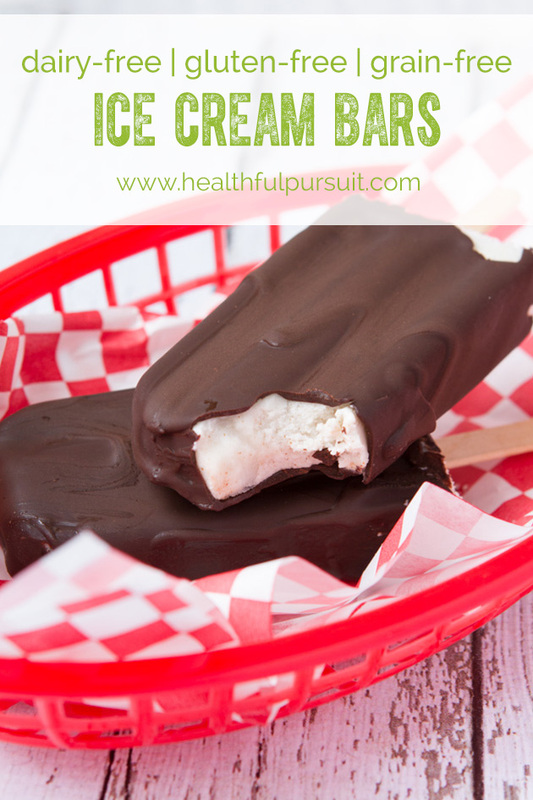 Chocolate-covered dairy-free ice cream on a stick. Just 7 healthy ingredients. Dairy-free Ice Cream "Cream Base"
Add cream base ingredients to the jug of your blender. Blend on high for 1 minute. Divide cream base between the ice pop molds, filling all the way up to the fill line. Cover with ice pop tops and transfer to the freezer to chill for 8 hours. Once frozen, line a clean plate with parchment paper and set aside. 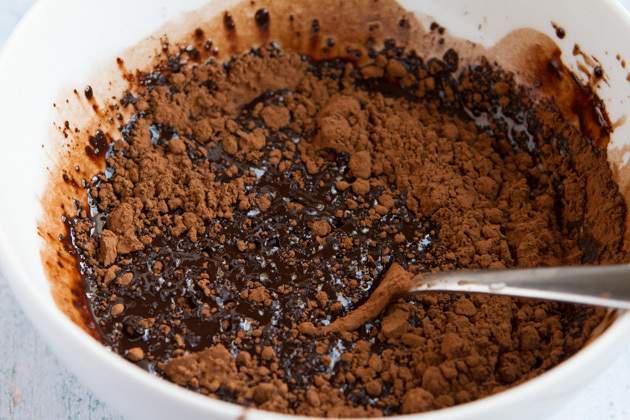 Combine cacao powder, coconut oil, coconut nectar, vanilla and sea salt in a small bowl. Mix until smooth. Remove ice pops, one at a time from the ice pop mold. 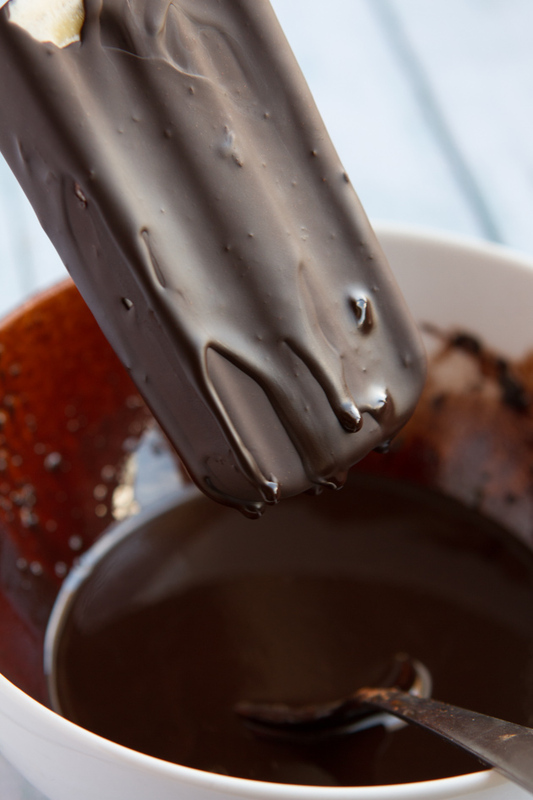 Working quickly, hold the ice pop over a clean bowl and pour the prepared chocolate sauce over the ice pop, rotating it and allow the chocolate to pour off of the ice pop quickly. The chocolate will harden very quickly. Transfer the ice pop to prepared plate and place in the freezer. Repeat with remaining chocolate until all ice pops are complete. Chocolate: I do not recommend using store-bought chocolate for this recipe. Coconut Oil: coconut oil is used in this recipe because it hardens at room temperature. Cacao butter could also be used. 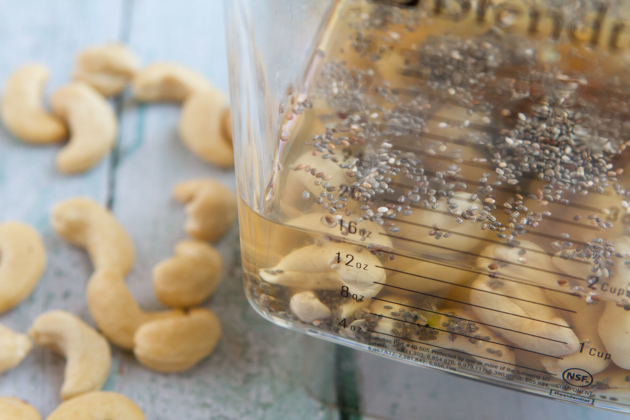 No need to soak the cashews. Just blend and get your ice pop on! Once it’s smooth, add to your favorite ice pop maker. 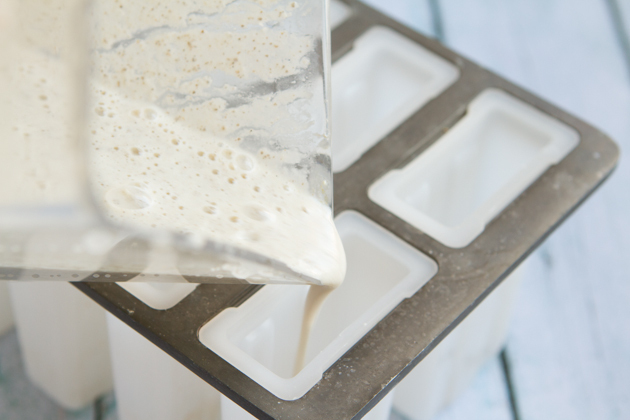 For this recipe, I used this ice pop mold. If you are concerned with BPA, this Norpro ice pop mold is BPA-free. The hardest part is waiting 8 hours until they’re set. And coat those dairy-free ice cream bars. The easiest way to do this is listed in the recipe. The chocolate hardens fast so you have to moooove it.